As I headed out to conduct the Finely Chopped Bohri Mohalla Ramzan Walk 2015 on Saturday I asked myself what I wanted the walk to be about. I was clear that I wanted the folks who were coming to the walk all the way from Thane, Kandivli, Borivli, Andheri and so on to have a really happy evening. For them to make new friends. To get to learn about new cultures. 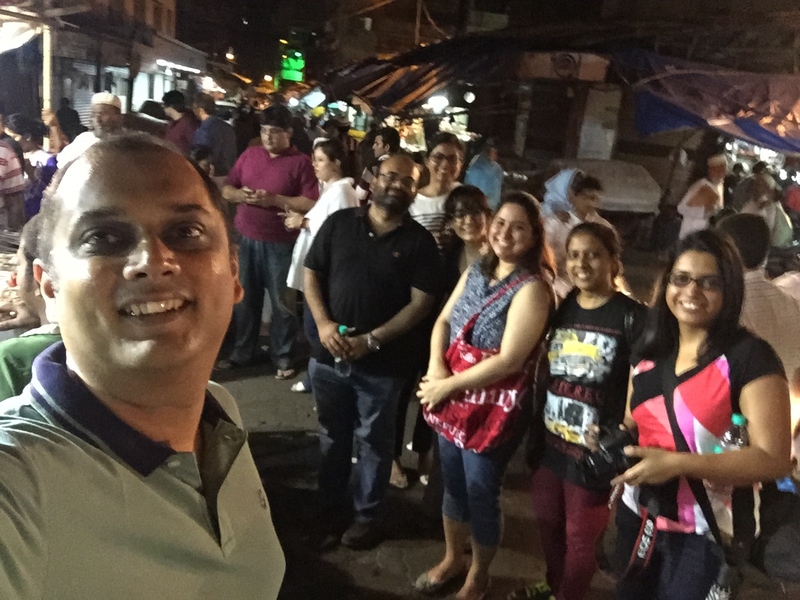 We were a group of Hindus, Parsis and a Buddhist setting out to discover the joys of Muslim and Bohri food. I wanted them to try out some great food. I had to plan the route out well as I wanted them to try out everything I had in mind and yet not waste anything. I was reading Arva Ahmed of Dubai’s Adventures of A Frying Pan tweet about five star hotel Iftar buffets in Dubai and how wastage of food is against the spirit of Iftar. I was very conscious that we shouldn’t waste food. I also wanted business to come to the food merchants of Bohri Mohalla. Through the money we would spend to a small extent. 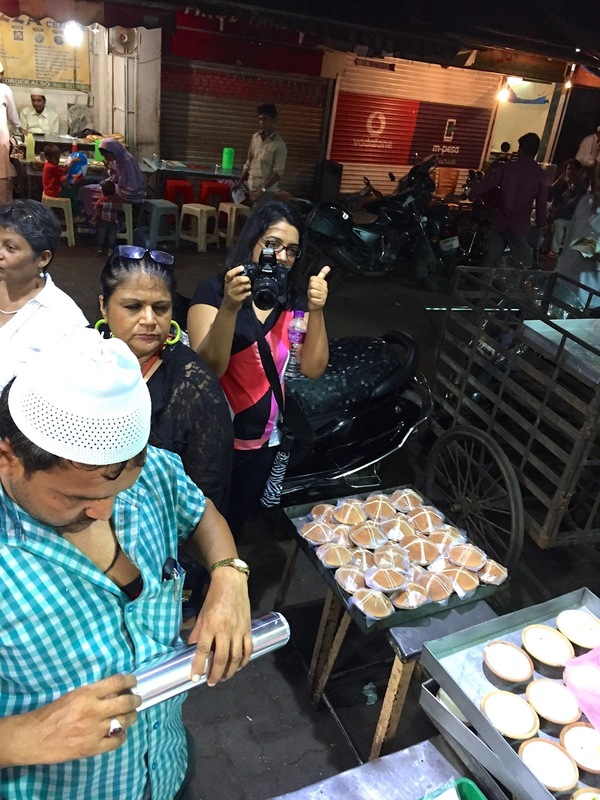 To a larger extent by our spreading the word about what we were eating and, through that, inspire others to go to Bohri Mohalla to eat. I had asked Arva on twitter about what she felt was the spirit of Iftaar and she replied to me about the same. @Finelychopped Moderation. Family. Generosity. And Gratitude. This is what I hoped out walk would centre around. Dr Daisaku Ikeda, President of the Soka Gakkai International, once quoted its earlier president Josei Toda who said: "Everyone's ideal is to get a job they like (beauty), that is financially secure (benefit), and where they can contribute to society (good)." Beauty, benefit and good are what I wanted my walk to be about at a personal level. Bohri Mohalla, which K points out has been lucky for me, provided just the right canvas for that. The people are so warm and welcoming. The vibes so positive. The food so brilliant. As always I had a great group of people to walk with. Folks who were curious, open minded, wanting to learn about others, hungry for good food, not constrained by any preconceived notions, out to have a good time. I use my iPhone nowadays, after having lost one DSLR too many. So let me tell you the story of the walk through the pictures I took while on the move. Please scroll down and walk with us through the pictures below. The first stop was Taj Ice Cream, the 125 year old hand churned ice cream place. A refreshing stop after the long journey folks had made to reach here. Strawberry, mango and the recent hit peru (guava) were on the table. Next on were kebabs at Haji Tikka. The owner and founder passed away last September. His son proudly carries on the legacy of his father's hard work. They serve my favourite kebabs in town. After trying the smoky, scrunchy, creamy khiri (buff udders) and buff kofta with parathas, the folks on the walk agreed with me. After kebabs we headed to the 50 year old tava cooking place, India Hotel. Asif, the owner's son tells me that their style of cooking has come from Burma. His father had come to Mumbai from UP. We had the bheja (goat's brain) and gurda (kidney) tava stir fries which were heavily spiced. 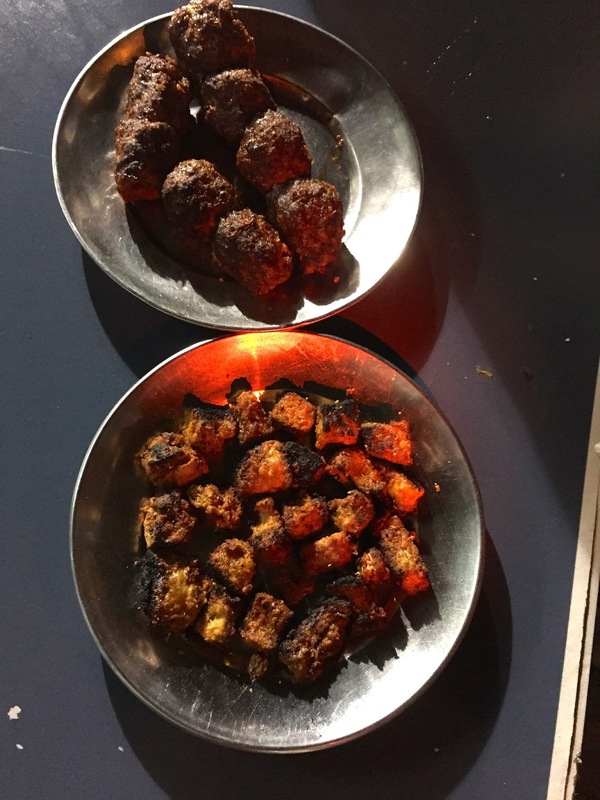 The Karachi mutton (buff) rolls were next. They make a chicken and cheese version too. And the fried potatoes which I once ordered for a vegetarian in a walk and which were mopped up by the non-vegetarians around. 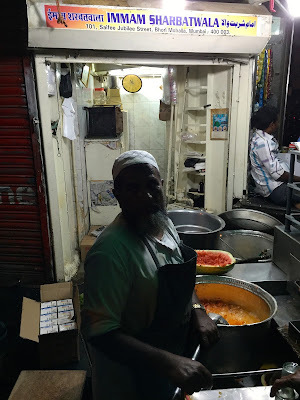 We then went to Salman's opposite Noor Sweet for the excellent pulao there. You get chicken but we went for buff. Salman's father had got the recipe with him ten years back from Bulandshahar in UP. You don't see any masala but the spices hit you when you take a bite and tantalise you. After Salman we crossed over to the 80 year old Noor Sweets where the jalebi maker has been making jalebis for 40 years. The trick is to get them to make you fresh jalebis for you. The crunch is bewitching and the sweet balance just right. The owner, Hozefa, a Bohri, also runs tuition classes! The sweet break at Noor primed us up for a very meaty halt next. We were at another 80 year outlet, Surti Bara Handi. We tried pichhota (buff tail), paya (goat's trotters), nalli nihari (marrow) with hot rotis and revelled in the beauty of this slow cooking technique which renders odd cuts of meats into silken goodness. 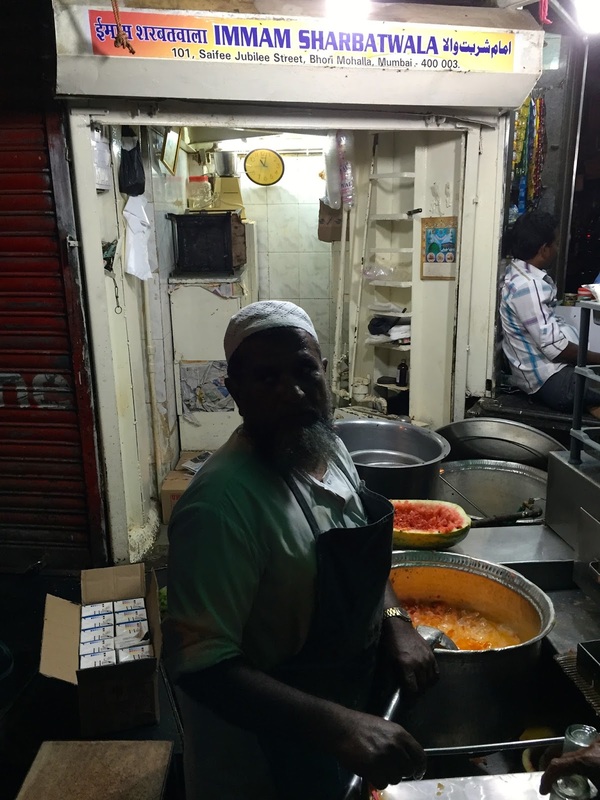 The 90 year old Imam Sharbatwalla was the perfect stop after the 80 year old Surti bara handi. The sherbat (a sweetened masala milk infused with chunks of watermelon and shaved ice) was just the palate refresher that folks needed and some went in for seconds. Which brought us to the last stop, the 50 year old Tawakkal Sweets. It had started of as a small shop selling sugar syrup soaked dahi vadas (balushais with a dahi based filling very different from South Indian dahi vadas). We stopped for malpuas, made specially during Ramzan. I have had them at Suleman at Minara and feel this is better. And for breakfast the next day, goody bags of firni from Tawakkal. A night of near spiritual eating had come to an end and I was thankful for the love I had been showered with. No wonder Bohri Mohalla is one of my favourite places to eat in at Mumbai. Fascinating food walk.... curious to know if the quantities ordered at each restaurant are sufficient for so many participants. For eg: only one plate of each dish at Surti handi and only one malpua to be shared between so many? I had imagined that foodie participants would be able to polish off entire dishes single-handedly LOL.